But since I live in a house now, I've finally been able to expand my decorations to a yard! My original plan was to just go to Hobby Lobby and buy whatever outside Halloween decorations I felt were satisfactory. And then I listened to Welcome to Night Vale. Suddenly I didn't just want generic smiling pumpkins in my yard or cute happy ghosties. No, I wanted to make my yard the Night Vale Dog Park. I wanted warning signs. I wanted hooded figures. I wanted it all! I figured it was perfect because Night Vale is in the desert and so am I! Granted, the one big difference between Albuquerque and Night Vale (other than, you know, all the conspiracy theories), is that Albuquerque has real mountains. So it's hard to live here and not believe in mountains. But I had a desert-y yard so why not use it? 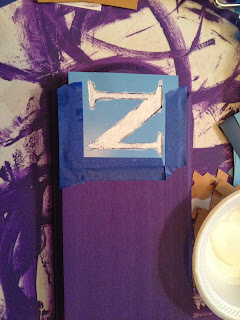 I've said before on this blog that I don't consider myself crafty, and that's true. But if there is one thing making a Nova helmet taught me, it's that I am an engineer by golly and I can make things. So I went to Hobby Lobby, bought some paint, bought some wood, and set to work! 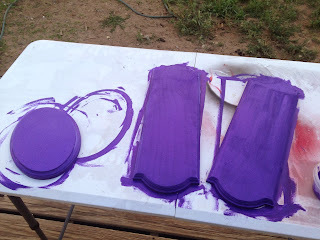 First I painted some signs purple! Why purple? Well the Night Vale logo and website have made it very clear that Night Vale is a town that supports shades of purple. Next I got to work with some stencils! 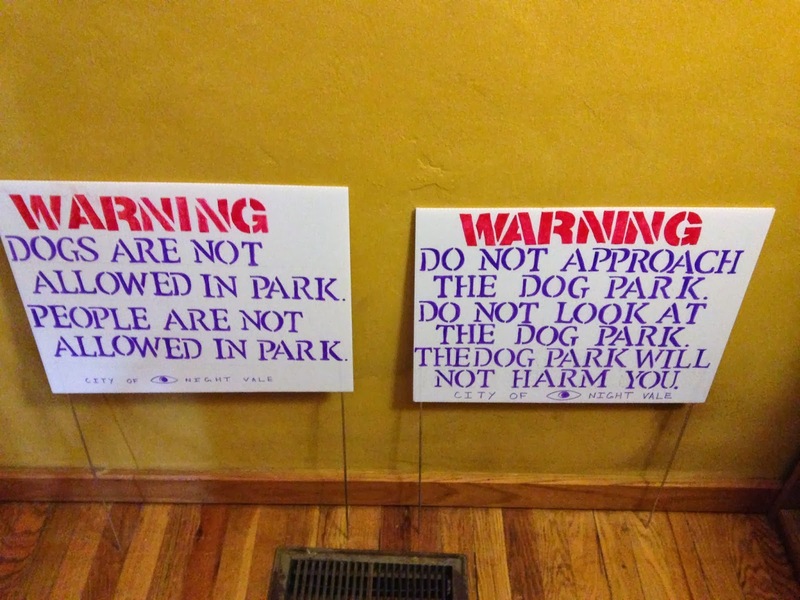 I made one sign like this that said Night Vale and another that said Dog Park. I bought a piece of wood/stake from Home Depot, painted it purple, and then glued both of these signs to it using Wood Glue. 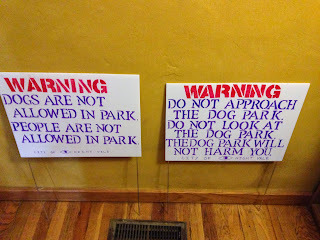 Then I set to work making some warning signs. These were MUCH easier. Basically I went to Walmart, found the section where For Sale signs and Beware of Dog signs are, and bought a "Make Your Own Yard Sign" kit. The kit combined with some permanent markers and stencils gave me some lovely signs like this! My last step was I bought some cheap, ten dollar black cloaks from Walmart. I then pinned them to the curtains on the front window of my house. Since the back of my curtains are white (ironically the front color is purple), the black cloaks really stood out. And voila! 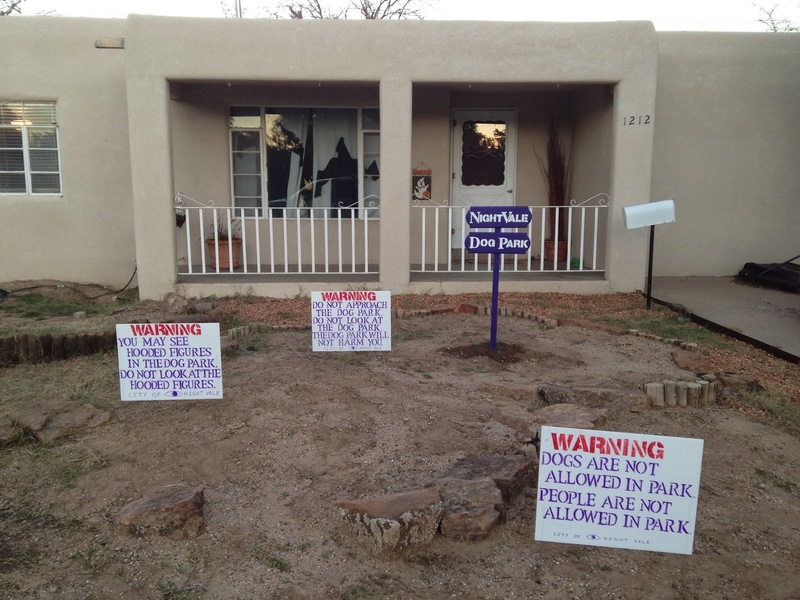 My "Welcome to Night Vale" Dog Park Halloween yard decor was complete!! All hail your awesome dog park! 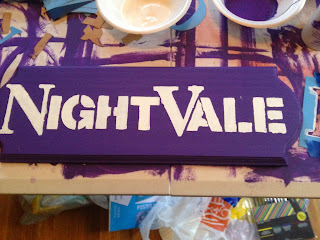 What is "Welcome to Night Vale?"